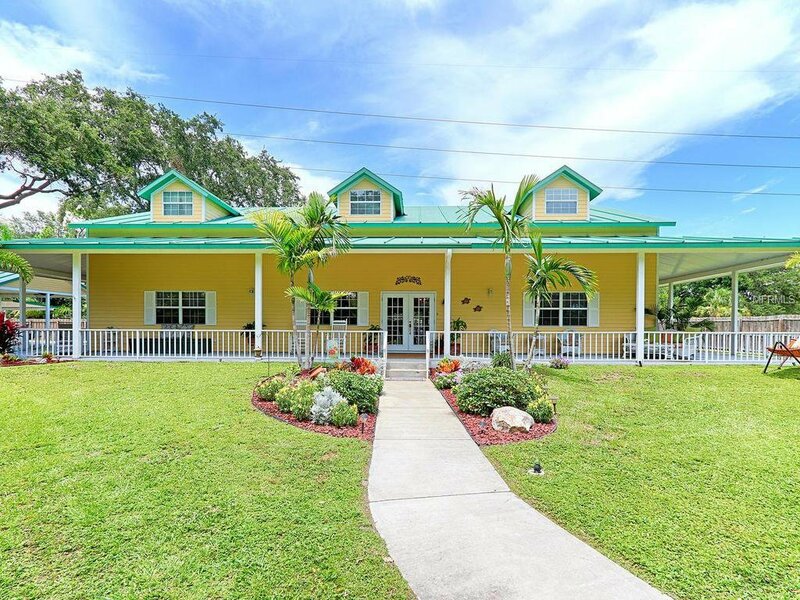 This beautiful, gated 2003 custom-built home in Bay Pines Estates is nestled on almost an entire acre of land just minutes from the Gulf. The green SIPs construction, metal roof, double pane insulated windows makes this home extremely energy efficient (avg $200/mo) Professionally painted Hardie board siding is low maintenance, fire/storm resistant. Owner states: "no flood insurance required." An inviting 2,480 sq ft wrap-around porch provides multiple outdoor living spaces.2 master suites with a 3rd easily converted are perfect for anyone who needs the option. Spacious upstairs bedrooms have dual walk-in closets. Kitchen has stainless steel appliances and large island; Built-in Bose sound system, security system included;Home has 2 large air conditioned walk-in attics. Detached 20x20 garage/workshop and 2 carports. Close to excellent schools, including Keswick. Gated entrance onto the Pinellas Trail is just a few minutes from Blossom Lake Park. Boaters enjoy quick access to John's Pass from the Veterans Park boat ramp. Old Florida charm abounds with mature oak trees. Irrigation well system has a new pump/timer. Rural Residential zoning allows an accessory dwelling to be built which could be used as a guest house or rental income; Reserve power installed. Plenty of room for RV, boats, recreational vehicles and pool. Zoned for horses. Located in the greater Seminole area, this newer construction, captivating home is close to everything you need and want and yet is tucked away for privacy and exclusivity. Listing courtesy of JACK KELLER INC. Selling Office: KELLER WILLIAMS GULFSIDE RLTY.